FILE: A look at Parker Cole Crossing in April. 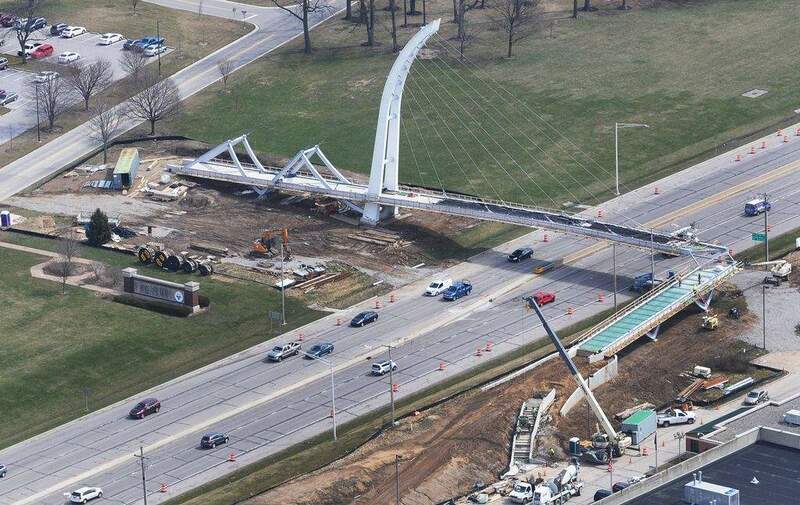 With construction of a new pedestrian bridge across Coliseum Boulevard nearly finished, additional time has been added for testing the structure, officials said Wednesday. The Parker Cole Crossing, spanning Coliseum Boulevard East just west of Crescent Avenue, connects Purdue University Fort Wayne and Ivy Tech Community College. It was initially set to open in June, but the completion date is still undetermined, according to a Purdue Fort Wayne news release. The Indiana Department of Transportation, which is overseeing the project, added the additional testing to ensure the bridge fulfills design and construction standards, the school announced. In a phone interview Wednesday, Justice said a series of standard tests resulted in some modifications, which is common. The testing is primarily responsible for pushing back the opening. The Indiana Department of Transportation is paying 80 percent of the $4.5 million cost. Donations from the Olive B. Cole Foundation and Mac and Pat Parker are covering the rest. During ground breaking in April 2017, officials said about 1,000 students travel between the two schools daily. When finished, the bridge will light up and be able to change color at night with more than 200,000 LED lights. Justice said the bridge is about 95 percent finished. There was a slight delay with lighting. In the coming weeks, decorative panels will be added and other small details will be completed, he said.